As your kitchen is something you use every day, it stands to reason that you would want to this to be the most alluring room in your house. ProSource® showrooms have the resources to help make your dream kitchen a reality. With top-quality materials, at low prices, you will be able to supply your remodeling project with the items your need. Coming to one of our showrooms will give you a clear example of what your client’s kitchen could look like. If you find yourself inspired by certain styles, our showroom will be able to provide you with the exact items used. The cabinets in your kitchen are used almost every day. Kitchen cabinets are also one of the most noticeable features in a kitchen. If you are currently battling whether to go with a certain shade of cabinet, our showroom can show you what they look like on display. 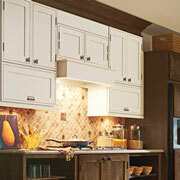 If you are satisfied with a display, you can make your kitchen purchasing decisions much more confidently. 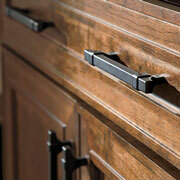 Every cabinet needs hardware, such as knobs or handles. At our showroom, you will be able to visually see how certain pieces of hardware look with our kitchen cabinets. Our hope is that by seeing these examples, you will be able to make definite purchasing decisions that you will be happy with. At our showrooms, we offer a variety of countertop options — from granite to marble and more! 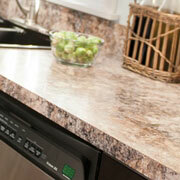 If you are interested in a countertop to coordinate with your kitchen cabinets and furniture, visit our showroom. 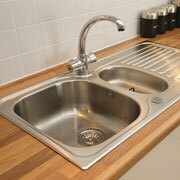 If you would like to remodel your client’s kitchen, a new sink is one of the first things to purchase. By getting a large, decorative sink, you can give your client’s kitchen a luxurious quality, while also making your life much easier. If you are planning to get a new sink, a matching faucet is necessary. 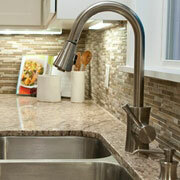 Come to ProSource of San Diego North for a selection of new kitchen faucets.